If you know me then you would know that I do have a sense of humor. I believe that laughter and smiles are truly the best medicine. So today I have put together this funloving novelty gifts gift guide for my readers. 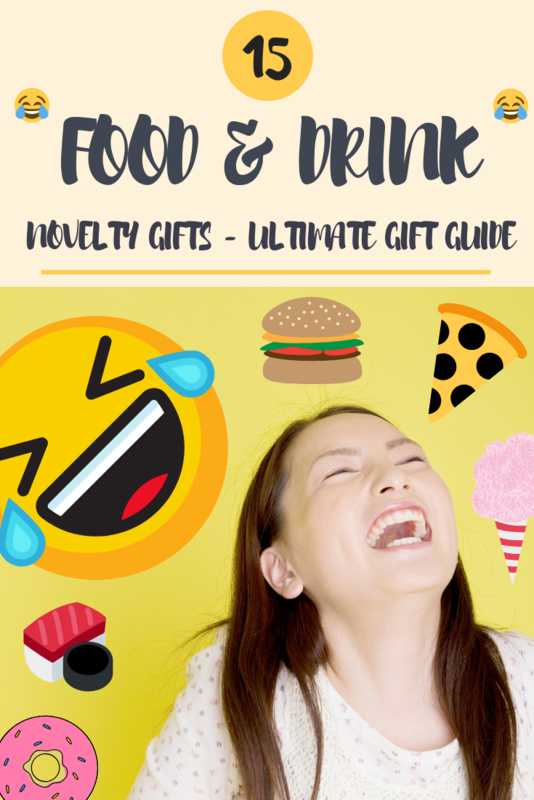 The 15 items that I have included in this novelty gifts gift guide are sure to put a smile on your face or the recipient’s face! We have everything here from nutsack tea infusers to canned unicorn meat included here! I absolutely LOVE putting novelty gift guides together over here at Give It A Whirl Girl. Stuff like this is totally my style and right up my alley. Here we have a realistic throw blanket that resembles a cheese and pepperoni pizza! This pizza throw blanket measures in at 60″ in diameter and is made from a soft, polyester fleece material. This pizza blanket is perfect for the pizza lover in your life and is great for snuggling up into. I gotta just come out and say here how brilliant and genius and brilliant this Teabagger Tea Infuser is. Hiliarious! Have you ever seen a tea infuser that is funnier than this one? Nope… not me! For those of you who are hurting in the testicles department, there is a special Blue Balls Edition Teabagger Tea Infuser. And they didn’t want to leave out the Chocolate Lovers so here is their Chocolate Lovers Teabagger Tea Infuser. This snot-nosed egg separator is a must-have item in your kitchen if you have any sense of humor. I can’t think of a better more enjoyable way of separating your eggs! These funny drink coasters from Ultimate Hostess contain the perfect amount of an offensive attitude. Try not to be offended here, they are just having fun! Ummm hmmm… not sure what the heck unicorn meat tastes like but if you are curious and intrigued by this canned unicorn meat from ThinkGeek I say GO FOR IT! They say it is an excellent source or sparkles and that there is magic in every bite. This is a pretty darn impressive item from Nostalgia. This is a grilled cheese sandwich toaster that is capable of creating two grilled cheese sandwiches for you in minutes! Ahhh yes! Gummy candies… a major HUGE weakness of mine! This is a 7 oz. giant gummy cheeseburger. This gummy candy has the flavors of cherry, orange, and sour apples. Serve up your next batch of Mexican food on Taco Tuesday with this 4-pack set of dinosaur taco holders! This brand, Blue Q, totally blows my mind with their clever and witty designs for your kitchen. Blue Q has some gut-busting funny oven mitts and dish towels available. This brain ice cube mold is sure to make your next drink stand out from the crowd. This 3-dimensional brain mold creates 4 brainy ice-cubes. Anyone remember when Deez Nuts wanted to run for president. I do! This is a banana bread, toasted coconut, and hazelnut-scented candle in a glass jar. Show off your love for food on your feet with this super duper fun food sock set! This set contains 12 sets of food-related socks. I am head over heels in love with this Fred & Friends reusable rainbow party cup AND this is an item that I do actually have the pleasure of owning! This is my go-to cup for when I need to wet my whistle! I believe that everyone should play Jelly Belly’s Beanboozled game at least once in their lifetime. This simple game is sure to bring belly laughs to the table with gross flavors like barf, boogers, and rotten eggs. There are also some yummy flavors of Jelly Belly jelly beans in here. You never know what you are going to end up with when you spin the Beanboozled wheel! This is such a fantastic game to play with family and friends. You might just want to even video record the reactions that you end up with on your face when you take a bite out of one of the disgusting jelly beans. Yup… this coffee mug basically sums up my life! I love this coffee mug from LookHUMAN. This is a brand that has a ton of clever items available. LookHUMAN knows how to make someone’s day with their clever and witty products. What food & drink novelty gifts do you love from this gift guide for the foodie in your life? Leave me a comment and let me know what item(s) made you laugh out loud! This entry was posted in Manic Monday, Shopping Guide and tagged amazon, blanket, blue q, candle, candy, cheeseburger, coffee mug, dinosaur, fashion, foodie, fred & friends, game, gift guide, grilled cheese, gummy candy, jelly beans, Jelly Belly, LookHUMAN, Nostalgia, novelty, nuts, pizza, shopping, shopping guide, taco, toaster, unicorn. Bookmark the permalink. I am with you Jenna! I love the food socks too! Same Kelly! I absolutely love the Teabagger! On my wishlist! I could definitely use that anxiety mug. LOL I really love Nostalgia products as well, and those dinosaur taco holders are so clever! Anxiety mug earned a spot on my wishlist too! That grill cheese sandwich toaster looks amazing! Sure is! I would love that in my kitchen. The banana bread scented candle! It sounds so relaxing I’d definitely love to receive that as a gift or maybe just buy it myself. So many cute gifts! My favorites are the socks and some of the mugs. Omg this post brightened my day!!! Those coasters are SO me 😂 and that avocado keeper is genius. I have a tomato and onion one but I need the avocado one. Now, that colander is far too funny. Praise FSM and his noodly appendages 😂🙏. Lol! I am so happy to hear that this gift guide brought a smile to your face! I love creating these novelty gift guides! This was really cute! Lots of things I hadn’t seen before. Amazing Post. Seriously. Quite innovative gift ideas. I think I can gift Anxiety Coffee mug to some people around me. They really need it.